Miguel Penabella floats down the river, sipping his Mai Tai. 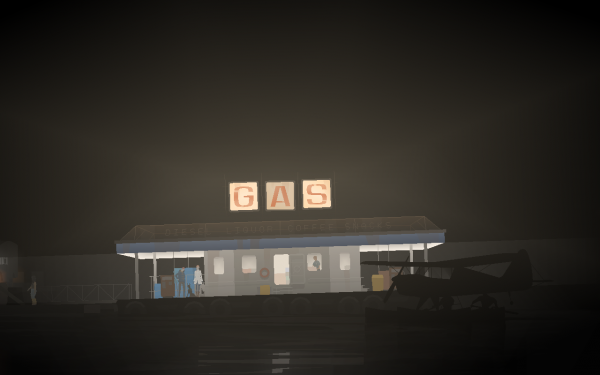 This is part three of a comprehensive overview of Kentucky Route Zero. See also: Part one, part two, part three. The fourth act of Kentucky Route Zero shifts location from the serpentine roadway of the Zero to the subterranean waterway of the Echo, referencing locations like Mammoth Cave National Park but reimagining them as a lived-in, folkloric world onto itself. A beguiling travel handbook from 1860 identifies the underground Echo River in a state of existential solitude, remarking, “A rise of eighteen feet water, however, fills the avenue of Purgatory, and cuts off all communication with the outer world.” Kentucky Route Zero envisages a floating society of houseboats set adrift in the darkness of these caves, a place where wayward travelers idly paddle downriver and an unanchored gas station flows “anywhere up and down the Echo” for fatigued sailors to discover. Act IV’s new river setting alters our primary mode of transportation, thus radically changing the pacing and very structure of the game. Where previous acts tasked players with walking, driving, and flying across the map of Kentucky to unfold the secrets of the Zero, this navigational agency has been stripped from the player. Since Conway and his companions have boarded the rusty Mucky Mammoth tugboat, we are no longer in control of our direction as we do not pilot the vessel, and we are subject to the contingency of the current. Rather than purposefully travel, we simply watch as the boat floats downriver and bumps into some interesting onshore curiosity, and choose whether or not to remain with certain characters on the boat or follow the more enterprising adventurers as they disembark. Act IV is fundamentally concerned with this passive state of a passenger, and how this passivity may reflect a response to the overwhelming despair of economic downturn and corporate forces too powerful to oppose. Traveling along the sunless Echo River abstracts any sense of time and place. Thick, grey fog and darkness encircle the Mucky Mammoth, and without visible surroundings with which to orient oneself, it feels as though the boat is motionless and dislodged from time. When the boat eventually docks at the Rum Colony, a sleepy beachside watering hole, the game slows to a hypnotic crawl as Conway delays his package delivery and leisurely drifts from place to place. Who can blame him? 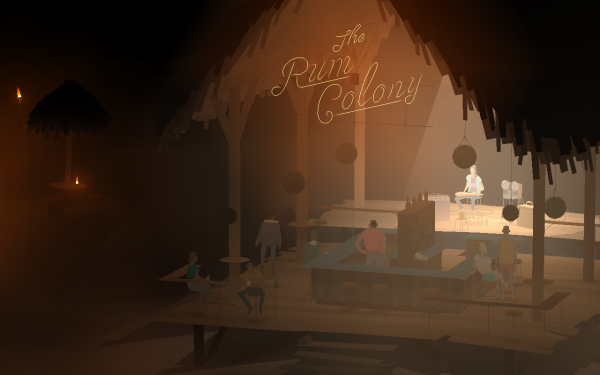 The Rum Colony’s hazy, candlelit tiki bar housed in an open-air cabana may be the most attractive diversion in Kentucky Route Zero, summoning sightseers with the warm amber glow of torches and lulling beachgoers as the waves gently wash up against the shore. As barflies slur through conversations, Conway loses himself in the drink. Like the apathetic lotus-eaters of Greek myth, Conway dismisses his goals and contents himself with the soothing lap steel guitar of Ben Babbitt’s score. The weightless strings of tracks like “Glowing Arms” recalls Daniel Lanois’s work with Brian Eno on the seminal ambient album Apollo: Atmospheres and Soundtracks, specifically the track “Deep Blue Day,” its guitar twangs seemingly broadcast from across the galaxy. An endless drink selection of rum and Curaçao cocktails mixed by the bartender Patch—bearing evocative names like Fragrant Reminder of the Captain, Salty Memory on the Dracula, Strong and Old, and The Dark Death—clouds Conway’s mind, rendering him stagnant. Conway’s inebriated passivity throughout this act renders him ineffective in retaliating against the capitalist system that oppresses him, as he is lulled to a state of fatalistic complacency. Such forgetfulness of one’s goals and motivations contribute to what Robert Yang identifies as the game’s broader thematic interest in “decaying memory and history” as Kentuckians struggle to remember why things are the way they are, instead silently accepting their sorry predicaments. Yang allegorizes the abstruse capitalist infrastructures of Kentucky Route Zero in terms of the legacy system, a software concept that refers to old systems so deeply entrenched that nobody fully understands their inner workings, and whose removal would be difficult and costly. Kentucky Route Zero presents us with a world comprised of such legacy systems, where characters fall victim to the Consolidated Power Company and its tentacular influence in all aspects of society, from utilities to healthcare to broadcasting to real estate. Characters’ passive acceptance of its control preserves its existence. In Act III’s tour of the Hard Times whiskey distillery, characters make reference to an abstract, divine Formula that calculates interest and repayment, and its financial estimates organize the lives of the conscripted workers even as the company always collects the earnings. Such legacy systems evoke broader societal ills such as moneyed rentiers leveraging control over property and deep-seated debt at the expense of the underprivileged, parasitically devouring the world’s wealth. In Kentucky Route Zero, characters’ religious devotion to the Formula discourages any questioning of its arcane logic, and thus, characters are endlessly conned. As Conway takes the passenger seat to the story, supporting characters step up in central roles, laying bare their insecurities and anxieties and grappling with unclear futures. Apart from our familiar protagonists, Act IV introduces the other seafarers of the Mucky Mammoth: Will, the woolgathering hippie narrator and organist of interlude Here and There Along the Echo; Cate, the doula-turned-tugboat-captain prone to reminiscing of her past life aboveground; and Clara, a displaced Theremin wunderkind from Lithuania. Like the many characters stumbled upon throughout Kentucky Route Zero, the stories of these dispossessed, roaming drifters are ones of loss and aimlessness. Because this act is structured as a series of vignettes dependent upon the player choosing to stay on the boat with certain characters or briefly disembark for a scene, we’re treated to a diversity of character perspectives even as the other stories unspool offscreen. Johnny’s story particularly stands out in this act; unlike Conway, he’s looking for some kind of change and attempting to chart his future. At a gas station, Johnny and Junebug engage in small talk with strangers. These non-player characters share experiences and lessons that affect the couple’s worldviews. Johnny’s central worry is that he feels restless and is seeking more permanence in life. He and Junebug were designed as robot mining workers but have since fled upon finding a new call as musicians. Each interaction with a stranger contributes to their fluid identities, as they are frequently seen morphing their outward appearances from scene to scene. Because Johnny and Junebug are always on the move and are constantly shifting their image, Johnny fears that his essential identity is unfixed. I’m reminded of the oddball, computer-generated social media personality Lil Miquela, who, in various Instagram posts, conveys the existential crises of a robot uncertain of her own histories and memories. 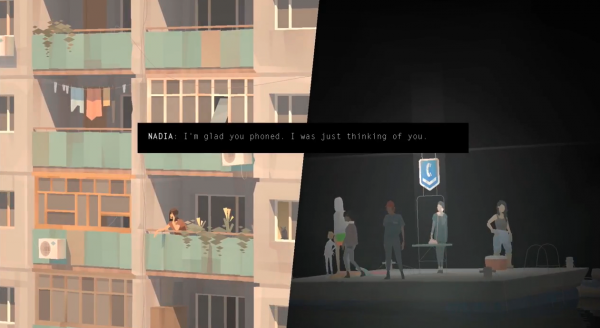 In every encounter within Kentucky Route Zero, characters transmit part of themselves to another, keeping their stories—and a broader collective memory—alive. Through oral narration and small talk with strangers, characters reach out in a gesture of empathy, enabling emotional connection and the potential for personal transformation. A later scene where Cate and Ezra go mushroom hunting in a riverside grove further demonstrates how mundane dialogue can tease out subdued emotions and recuperate memories threatening to go extinct. As Cate and Ezra individually forage mushrooms, the game offers two discrete dialogue boxes for each character, allowing the player to investigate their thoughts simultaneously. Recalling Merritt Kopas’s Twine game Brace, a text adventure for two players that explores dual perspectives, we must alternate our attention between Cate and Ezra, piecing together a more complete picture of the characters and their companionship from these fragmented dialogue branches. Choices initially involve their actions exploring the grove, before ceding to their inner thoughts and memories, thus opening the player to their past lives. As your eyes dart from one character’s monologue to another, your attention will open up or foreclose their backstories. Cate can either reveal a past miscarriage or her experience as an adolescent runaway, and either history affects our understanding of her work as a doula, offering homeopathic and alternative medicines to ease the pain of pregnant clients. The decelerated pacing of Act IV allows room for reflection, encouraging characters to ponder where they have been and where they might go in the future. In lieu of immediate risks and objectives that must be addressed, characters find themselves in stasis as the gentle current of the Echo takes hold of their trajectory. Despite the tranquility of Act IV, violence and discord still lingers in these spaces. A memorial to the dead miners killed in the flood at Elkhorn Mine imparts a furious polemic against the power company that let them die. At the end of the act, Conway yields to the pressures of the company, buying into the idea of indentured servitude at the distillery. “They could even help me take care of these medical bills for my leg,” he reasons, resigned to the suffering of the other workers he’s seen around him. “Get it all together on a plan. Consolidated.” The company indiscriminately levels all characters to the role of debtors, making no distinction between its skeletal workforce and those who exist outside its grasp. All can be potentially shanghaied for conscription, including Conway, who at the close of the act sorrowfully accepts his fate as he is spirited away into the darkness, leaving behind the faint glow of his electrified body. And yet, the potential for life to thrive in the darkness of the Echo River persists in spite of this anguish and conflict. Somewhere along the waterway, we’re treated to an anecdote of two feuding sisters. These bitter, irreconcilable neighbors sequestered themselves on separate parcels of land, but the stalks and roots of the sunflowers they each grew have since tangled together, forming a single field. Upon their departure, a property clerk erased the legal border between them, formally bonding these foes in solidarity. At a microscopic level, Kentucky Route Zero is a melancholy tale of tragic characters, but against the relief of the longue durée, there’s still hope to be found. These sunflowers that grow in the darkness of the caves and the buried seeds waiting to bloom will long outlast the characters, surviving as a living index to the histories, memories, and stories that give this world life. In the final installment of this comprehensive overview of Kentucky Route Zero, I’ll tie together the overarching thematic and narrative concerns that five years of work have built towards in the concluding act of this game.